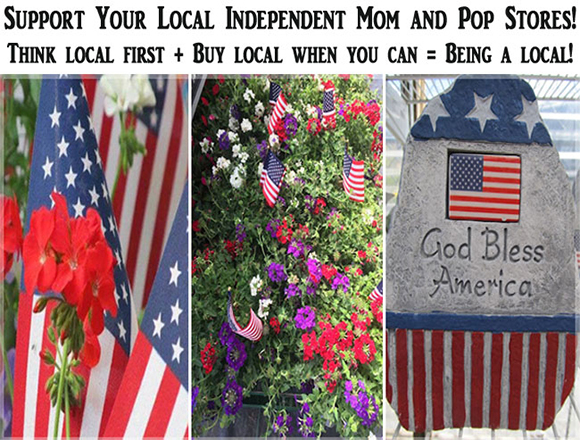 Why Buy from Local Independent Stores? There are many well-documented benefits to our communities and to each of us when we shop at local, independently owned businesses. We realize it is not always possible to buy what you need locally or from independents and so we merely ask you to Think Local FIRST! Studies have shown that when you buy from an independent, locally owned business, rather than a nationally owned businesses, significantly more of your money is used to make purchases from other local businesses, service providers and farms--continuing to strengthen the economic base of the community. Locally-owned businesses generate a premium in enhanced economic impact to the community and our tax base.) Shopping at neighborhood and independent retailers not only supports small business owners but also preserves jobs and supports the local economy. For every $100 spent in independently owned stores, $68 goes back to the community in the form of taxes, salaries, charitable contributions and more. When shopping at a national chain, that amount drops down to $43. Where we shop, where we eat and have fun--all of it makes our community home. Our one-of-a-kind businesses are an integral part of the distinctive character of this place. Our tourism businesses also benefit. Locally owned businesses can make more local purchases requiring less transportation and generally set up shop in town or city centers as opposed to developing on the fringe. This generally means contributing less to sprawl, congestion, habitat loss and pollution. Small local businesses are the largest employers nationally and in our communities, providing the most jobs to residents. Local businesses often hire people with a better understanding of the products they are selling and take more time to get to know customers. Local businesses are owned by people who live in your community, and are less likely to leave, and are more invested in the future of your community. Local businesses in town centers require comparatively little infrastructure investment and make more efficient use of public services as compared to nationally owned stores entering the community. A marketplace of small businesses is the best way to ensure innovation and low prices over the long-term. A multitude of small businesses, each selecting products based NOT on a national sales plan but on the interests and the needs of their local customers, guarantees a much broader range of product choices. In an increasingly homogenized world, entrepreneurs and skilled workers are more likely to invest and settle in communities that preserve their one-of-a-kind businesses and distinctive character. Gardening 101: Annuals, Biennials, Perennials, Trees & Shrubs ~ For those of You who appreciate and admire the beauty of a well-planned and cared-for garden, but have never been confident enough to create a garden of your own. There are a few basic things to know before you start this fun and rewarding adventure into gardening. Let’s start with the main categories of plants and flowers. Annuals live only one year. The term “annuals” can be confusing because you would think of “years”, something that should come back annually. Think of it as living for a single year. Just remember how often do I have to plant these flowers? annually. 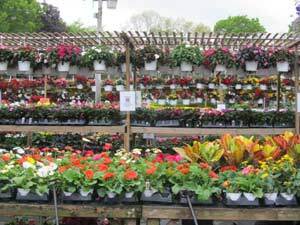 Depending on where you live, you can purchase flowering annuals as early as the middle of spring (with flowers already on the plant), and still have flowers clear into the middle of fall. So, you could have months of flowers. A plant being considered an annual or perennial can also depend on what part of the world you live in (zone). Perennials live for more than two years. Most perennials live many years. Some Perennials “multiply” by either new plants emerging from the roots, or by the same plant getting larger sometimes to the point that you may need to divide the perennial into two or three plants. The actual flowers on a perennials are usuallly short-lived, when compared to annuals. Expect perennial flower-bearing plants (not all have flowers) to be in bloom for a matter of weeks as opposed to numerous months for annuals. The exact length of bloom time for perennials varies depending on the plant. (The leaves usually live numerous months though and provide interesting texture to a garden.) You can plant a variety of perennials together that have staggered bloom times so that there’s almost always something in bloom. Sometimes when prunned back and fed well Perennials may have second or even third bloom times. As you look at the trees and shrubs around you, you may begin to wonder about the differences between the two. When is a plant a tree or shrub? At what size is it a shrub? A tree? First, trees and shrubs are plants that have woody growth. Many people, for example, think that banana trees are trees, but in fact they are not; they are considered to be the world's largest herb. Only plants with woody parts are trees and shrubs. Once you know that it has woody growth, you can determine whether it is a tree or a shrub. The general definition of a tree, according to USU, is a "woody plant usually having one perennial stem (trunk) at least three inches in diameter at a point 4-1/2 feet above the ground, a definitely formed crown of foliage, and a mature height of at least 13 feet." Shrubs are usually the opposite : a "woody plant with several perennial stems that may be erect or may lay close to the ground. It will usually have a height less than 13 feet and stems no more than about three inches in diameter." These basic definitions serve as good starting points to distinguish between annuals, biennials, perennials, trees and shrubs. As with everything in life, there are exceptions to the rules. You want to make sure your plants are getting the nutrition they need to grow beautiful and strong, but there are so many choices when it comes to selecting fertilizer. How do you know what is really in the bag? Most fertilizers have 3 numbers on their label, separated by dashes. For example: 5-10-5. This is the fertilizer analysis or percentage by weight of the 3 major nutrients plants need: nitrogen, phosphorus and potassium, in that order. These are abbreviated as N-P-K. So if you purchased a 10 pound bag of fertilizer labeled 5-10-5, it would contain 5% nitrogen, 10% phosphorus and 5% potassium. The remaining 80% would be comprised of other nutrients. 1st Number = Nitrogen: (N) The first number gives the concentration of nitrogen in the product. Nitrogen encourages foliage growth, among other benefits. 2nd Number = Phosphorous: (P205) The middle number refers to the concentration of phosphorous. Phosphorous contributes to many fundamental plant processes such as rooting and setting flower buds. 3rd Number = Potassium: (K20) The final number states the concentration of potassium. Potassium contributes to the overall health and vigor of plants. Complete Fertilizers: Fertilizers that contain all three major nutrients are considered complete fertilizers. Other Ingredients: Any additional ingredients will be listed on the side label. This may include other nutrients like calcium, magnesium, iron, micronutrients and even the percentage of organic matter. Many organic fertilizers contribute organic matter to your soil, improving its structure, feeding soil microbes, fighting fungal and bacterial diseases, and contributing micronutrients. Most organic fertilizers supply a slow but steady diet for plants. Complete organic fertilizers are now more widely available and have higher concentrations of nutrients than in the past, making them easy-to-use alternatives to chemical fertilizers. Chemical fertilizers add no organic matter to your soil and contribute nothing to improving soil structure: In fact, some research suggests that chemical fertilizers actually harm the microorganisms in the soil, making the soil less able to support long-term plant growth. Chemical fertilizers are concentrated and fast acting, but they have no long-term benefits for your soil: It's like taking a vitamin versus eating a good meal. Manufacturing chemical fertilizers requires larger amounts of energy, usually supplied by nonrenewable resources: This massive use of energy increases pollution, global warming, and our carbon footprint. At Van Bourgondien Nursery we are very proud to sell Our Own Unique Brand of "Organic Soil Conditioner" (Bumper Crop) and "Organic Fertilizer" (Garden Elements) that are sold at Independently Owned and Operated "Master Nursery Garden Centers". There is no one size fits all fertilizer. Fertilizer choice depends on the type of plant being grown and the soil it is being grown in. As Always follow the label instructions when using any garden product. Just because a little is good, it doesn't follow that a lot is better. If You have any questions please come in and ask one of our knowledgeable staff for assistance, we are here to help your garden grow! Echinacea is a beautiful addition to your perennial garden, and is hardy even in very cold climates. The only thing echinacea can be somewhat fussy about is too much moisture. It likes a fairly dry soil, and should not sit in wet, soggy soil conditions. If your soil isn't particularly fertile, work in some Bumper Crop and supplement with a good organic fertilizer. Once they are growing well, they will thrive. Rudbeckia are easy to establish, naturalize well and require little maintenance. Most rudbeckia come in shades of yellow or orange, with a dark center seed head, but there are also russet, bronze and mahogany tones. The flowers are daisy-like and can be single, semi-double and fully-double. These perennial flowers bloom in shades of yellow, orange, and pink and are very popular in perennial gardens. Coreopsis species are happy in almost any well-drained garden soil in full sun. They are drought-resistant and an outstanding choice for hot, difficult places. Hardy Succulents: Intriguing variety, color, and texture. Cold and frost hardy easy to propagate, and low maintenance. Categories include: hens and chicks, sedum, ice plant and and thymus to name a few. Succulents/sedums offer many unique textures, sizes, shapes and colors. These low maintenance plants are sun - drought tolerant, thrive in poor soil and spread quickly to fill the desired area. Sedums are decorative between paving stones, great in containers and create colorful ground-covers in landscaping and have brilliantly colored foliage. Many sedums have showy pink, red, or purple flowers in fall. Others bloom from May through August with white or yellow flowers. What's not to enjoy about these? Achillea are hardy North American natives. Tolerant of most growing conditions, but prefers well-drained soil and full sun. The flat flowers and soft foliage contrast beautifully with other perennials. They also attract butterfly. These are only a few choices available for sunny perennials we have lots more varieties to choose from. Next week we will feature some shade loving perennials. Planning a perennial garden is a lot of fun. It's a wonderful opportunity to stretch your imagination by experimenting with color and form, and by plotting seasonal bloom time. So if you haven't already discovered the joy of perennial gardening, we'd say it's never too late! Van Bourgondien Nursery has beautiful perennials arriving daily! Spectacular selections! This flowering shrub/perennial/ is a favorite for many gardeners. Hydrangeas come in different sizes shapes and colors and provide fairly long blooming flowers to a shade/partial shade garden. Are one of the most diverse and colorful shade/partial shade perennials. The variation of of their foliage colors are fantastic! This long time favorite perennial is one of the top plants for shade. Valued for its endless variations of green, blue, cream and white foliage, hosta also produces tall lavender or white flower spikes in midsummer. A fast-growing ground-cover, ajuga has low-growing foliage and flower spikes in pink, white, blue or lavender. Is a small (8 inch) native woodland plant. Nice fragrance and slower spreading ground cover. Gives you beautiful flowers in spring and 3 seasons of interest with shimming silver foliage. Their elegant foliage and different colors pair well with Heucheras, Brunnera & Hostas. They are a must in any shade garden. 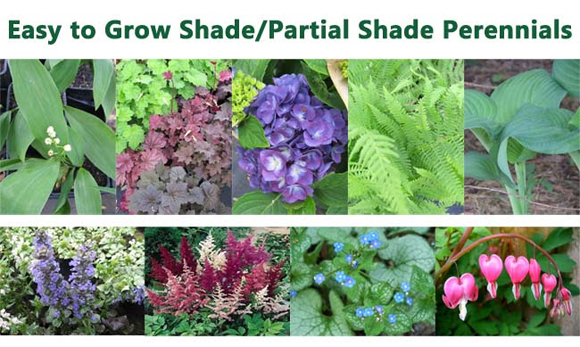 These are only a few choices for shade/partial shade perennial gardens. We also have an extensive line of ornamental shrubs, fruit trees, flowering shrubs and lower growing varieties to suit all your garden-scaping needs as well as all the accouterments needed for planting and growing success. 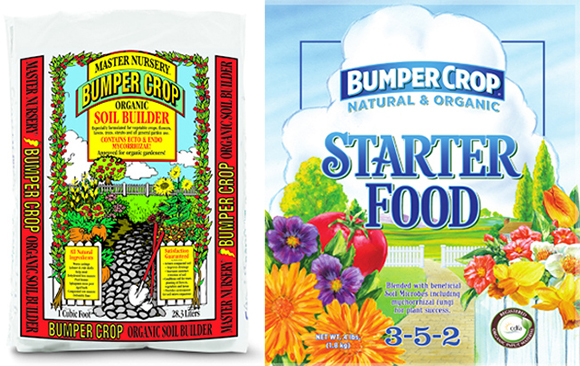 Bumper Crop Organic Soil Amendment and Garden Elements Organic Starter Fertilizer encourage trees, shrubs, bushes and perennials to establish their roots in your garden-scape! 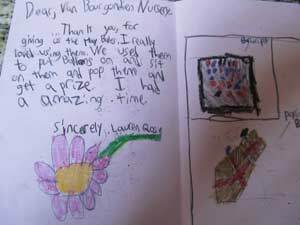 Van Bourgondien Nursery also provides planting and watering instructions to help ensure successful planting and growing. As always we are here to help your garden grow! 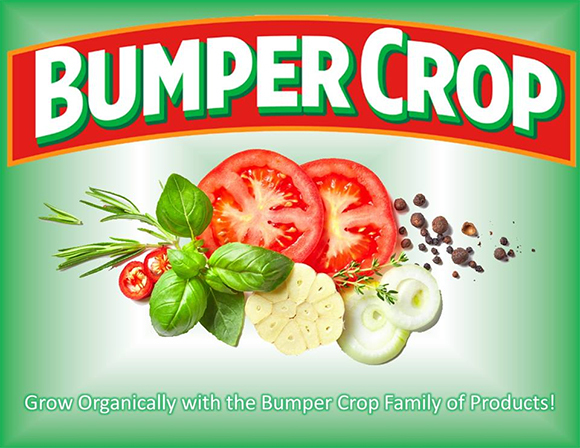 Bumper Crop Organic Soil Amendment is a soil building blend of manure and high organic nutrient content of shellfish compost, dark, rich earthworm castings (adds minerals and biology), kelp, peat, aged bark, and lobster – inoculated with endo and ecto michorrizal fungi to improve root function. The lobster body provides a lot of Nitrogen, and the shells breakdown to release a lot of Calcium, the #1 ingredients that plants need. 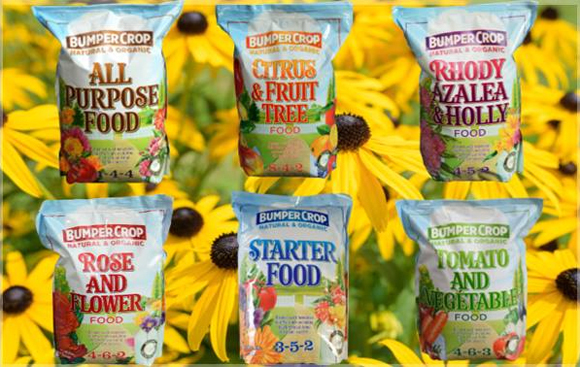 Bumper Crop Organic Soil Amendment is an all-purpose, pre-fertilized planting and garden soil amendment. This product excels as a nutrient rich top dressing and mulch. OMRI Listed..